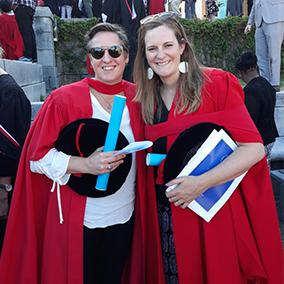 Dr Maxine Spedding & Dr Sarah Skeen (University of Stellenbosch) after graduation in 2017. A key gap in current mental health professional training in Africa and globally is an orientation to public mental health. This means an orientation to the mental health needs of populations, and the policies, laws and services that are required to meet those needs. The WHO has highlighted this critical shortage and has put out an urgent call to improve and strengthen professional mental health capacity in Africa. The Alan J Flisher Centre for Public Mental Health has heeded this call and has produced a steady stream of graduates over the last few years. This year has been no different with 5 MPhil and 1 PhD graduates. 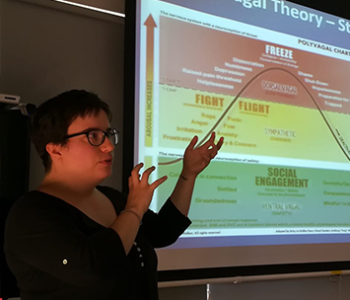 Megan Malan from South Africa studied the prevalence and predictors of intimate partner violence among women attending a midwife and obstetrics unit in the Western Cape. (Supervisors: Katherine Sorsdahl & Maxine Spedding). Also conducting a qualitative study, Winifred Nalukenge from Uganda, focused on mental health explanatory models, and the perceived impact of life experiences on mental health, in HIV-infected adolescents in rural and urban Uganda. Both Megan and Prasansa graduated with distinction. Based on an inter-disciplinary approach, the courses include inputs from staff from diverse academic backgrounds, including public health, psychiatry, psychology and the social sciences. 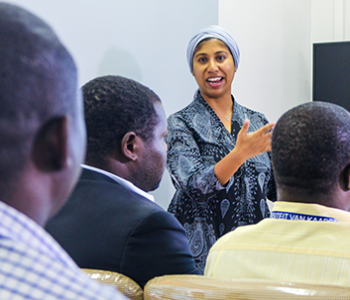 The courses are focused on the context of African public mental health, and thus draw on the experience of the lecturers and the participants, and all assignments are related to the ongoing work conducted by participants in their respective countries. In this way, the CPMH hopes to contribute to knowledge generation about low and middle-income countries by scholars of these countries, and graduates are strongly encouraged to publish their work in peer-reviewed journals. The capacity development programmes of the CPMH are groundbreaking in that there are currently no centres that offer public mental health training and research on the African continent. We take pride in pioneering this work in Africa, and are confident that our position in the developing world offers a unique training experience.